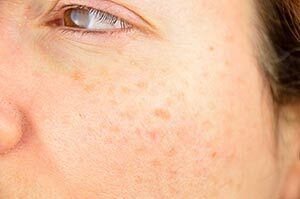 Melasma is mostly an issue for women, as only 10% of those diagnosed are men. It tends to affect people with darker skin tones and there seems to be a genetic component as well. As with other skin conditions such as rosacea, there isn’t a direct cause/effect relationship with melasma. 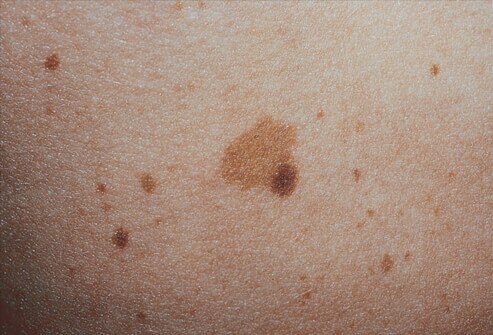 The condition is likely the result of overproduction of pigment by melanocytes. People with darker skin tones are more susceptible to melasma because they naturally have more melanocytes in their skin. Hormonal changes — Pregnant women often get melasma due to the fluctuations in their hormones. Birth control pills and hormone replacement medicines can also trigger melasma. Sun exposure — Ultraviolet light from the sun triggers melanocytes in the exposed skin to produce pigment as a safety mechanism of sorts. This is why human skin tans. Even melasma patches that have faded can recur when exposed to ultraviolet light. Cosmetics — Certain cosmetics can worsen melasma if they irritate the skin. Melasma doesn’t cause any internal symptoms, irritation, or pain; its effect is purely visual and results in brown or grey-brown patches on the skin’s surface. Melasma can fade on its own, especially if the patient protects their skin from sun exposure. Because triggers (such as hormonal fluctuations during pregnancy) resolve themselves after delivery pregnancy related melasma can resolve or significantly improve naturally. Women may choose to continue birth control pills even when it is playing a role in their melasma. In this case medical and cosmetic treatment of their condition will be necessary. We have various treatment options available at the Center for Dermatology and Laser Surgery to treat melasma. Hydroquinone — We use prescription-strength hydroquinone usually as a first option. When applied to the darkened areas, it decreases pigmentation in the skin. 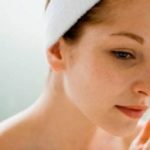 Tretinoin and corticosteroids — Beyond hydroquinone, these are the next two steps in enhance skin lightening. Sometimes we will use a cream that contains all three topical medications. Other topical medicines — Azelaic acid and kojic acid also lighten the skin. 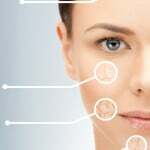 Procedures — chemical peels, microneedling, or laser treatments in appropriate patients. If you’re tired of your brown patches, call us at 503-297-3440 and let’s start addressing your melasma.